NFL free agency began three weeks ago, and Colin Kaepernick is still a man without a team, even in a league in which Mike Glennon just got $19 million guaranteed to actually start for someone. Is Kaepernick being blackballed because of his national anthem protest? It he still unsigned because of his lack of ability? His disinterest in football? Has he really become too much of a distraction? Michael Rosenberg tackles this topic in a column for Sports Illustrated in which he offers up some pretty solid informed speculation. Basically, it’s complicated. Rosenberg carefully tiptoes through a variety of nuanced, sometimes contradictory factors that all could explain Kaepernick’s continued unemployment—including the very possible notion that some of the retrograde billionaires who own NFL teams might think it’s not-so-hot for the brand for the starting quarterback to be kneeling during the national anthem. But what’s most striking—and refreshing—about Rosenberg’s take are the supportive opinions he presents from Jim Harbaugh and Chip Kelly, two men who coached Kaepernick in San Francisco. 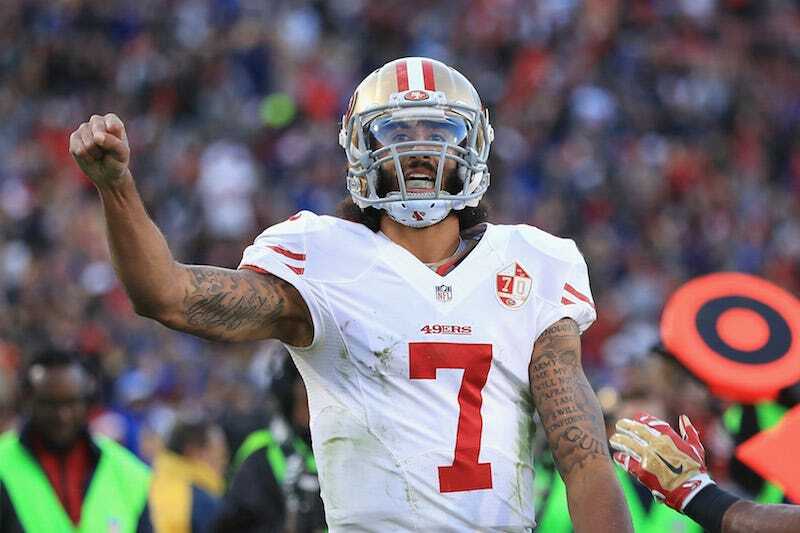 Why Is Colin Kaepernick Still Looking for a Job?